Swaziland’s Nobuhle Dlamini will be aiming for a fast start in the Sunshine Ladies Tour Dimension Data Challenge at George Golf Club, starting on Friday. 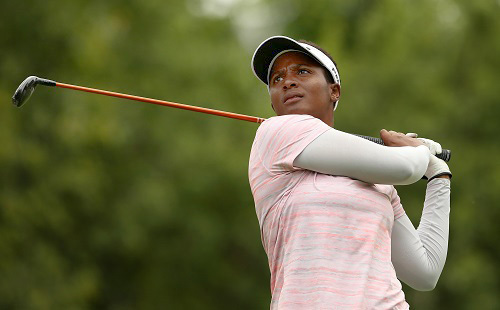 The 26-year-old Dlamini occupies fifth place on the Investec Property Fund Order of Merit after three events following fourth in the Joburg Ladies Open and top-15 finishes in the Canon Ladies Tshwane Open and last week’s Cape Town Ladies Open. Despite her lofty positions on the leaderboard, it was – by her own admission – costly opening rounds that have robbed her of the chance to seriously challenge for victory. “I’ve noticed in my last three tournaments that’s I’ve had poor first rounds,” said Dlamini who opened with 76 at Pretoria Country Club and rounds of 77 at Modderfontein and Royal Cape Golf Clubs. “My goal is not take myself out of contention this week. The former world number-two amateur has not broken through for her first victory on the Sunshine Ladies Tour yet, but that maiden title could be just around the corner, Dlamini said. The first two rounds will be played at George Golf Club, with the final round played at Fancourt’s testing Outeniqua course. The demanding layout at Outeniqua suits her power game. “I know George Golf Club and I’ve played it a couple of times. Also when I played amateur golf I played there quite a bit. I love the course, and I love Outeniqua as well. It all depends on the wind. I’m in good form to perform well on both courses. Despite her poor opening rounds in each of the three events on the Sunshine Ladies Tour this season, Dlamini feels consistently good scores are around the corner. “I’m happy with my start to the season. I’m swinging well, but I’ve just been struggling to score. I’ve put in good practice for Dimension Data and looking forward to it. Being fifth on the order of merit is also a positive, and there are some big tournaments coming up that can help me improve my position. Aided with a natural power game, Dlamini also spends a good deal of time making sure she is in great physical shape for every tournament. That also includes long distance running during events. One thing is for sure, like her running, Dlamini is not far away from going the distance in search of that breakthrough triumph on the Sunshine Ladies Tour.